A large temple, Kalyanesvari, Burdwan District. bl.uk > Online Gallery Home	> Online exhibitions	> Asia, Pacific and Africa Collections	> A large temple, Kalyanesvari, Burdwan District. 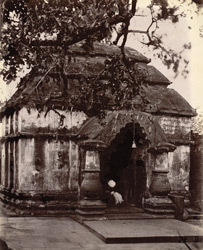 Photograph of the large temple at Kalyanesvari, Burdwan district taken by Joseph David Beglar in 1872-73. At the time it was taken, Beglar wrote: "All these [temples] appear to me to be of recent date - perhaps built of older materials...the principal temple, - a large, plain, massive, pyramidal, roofed, dark temple, with balustrade-shaped pillars in front..." (Beglar, pp.154-55). This photograph shows a general view of the square temple, facing the arched entrance. This was constructed from the remains of an older structure and, despite its late date, the arch was built in the traditional Indian, 'horizontal' style. The temple is inscribed in a number of places however many of these are now un-readable as the soft stone has worn away. One of the inscriptions is cut into the sculpture of Devi that forms the focus of worship at the temple.